A kaleidoscope of fusible flora, fauna, and critters! 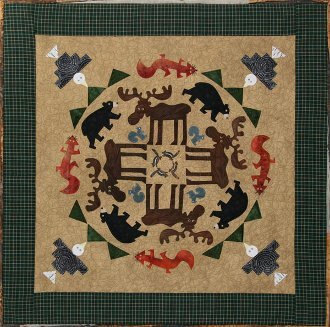 Let this friendly gathering of moose, chipmunks, squirrels, bears, foxes and bald eagles keep you company as you nestle in a cozy cabin in the woods. Simple straight-stitch applique is done at the quilting stage, which eliminates the need for a stabilizer. Easily adapted to your favorite method of machine or hand applique.